Something a bit different today–I rarely listen to audiobooks, but lately I’ve been listening to Great Courses. They’re like the best parts of college classes, without the hard parts. No papers, no exams, you’re never called on unprepared, and you get to study anything you want, whenever you want. In essence, the Great Courses find really excellent college professors, and have them put lectures on CDs in thirty minute sets. They have a huge variety available, so you can probably find whatever interests you. I’m a fan of Professor J. Rufus Fears. I admit I haven’t listened to a large number of Great Courses professors, but that’s in part because I keep listening to Professor Fears’ different courses. He teaches history, as you might guess from my blog title. You can listen to The Wisdom of History , which basically starts at the Big Bang (well, ancient Mesopotamia, at least) and goes forward. Or you can get more focused with his course on Famous Romans , or even more focused with his course on Winston Churchill. He has several other courses, but those are the ones I’ve listened to. Professor Fears has certain lessons of history which he reiterates throughout his courses (one of which is, we never learn the lessons of history). My favorite is the idea that history is made by individuals, not sweeping anonymous trends (this is quite at odds with Hari Seldon’s psycho-history, incidentally). I think this is the key to why I so enjoy these courses. Professor Fears is always talking about individuals and their stories–and he’s a wonderful storyteller. He gives you the quirky details, the comedy and the tragedy, and brings ancient figures to life as real, complex people, not stern marble statues. The Roman course has some wonderful pieces, especially about Hannibal, the Caesars, and the early emperors. Did you know Hannibal had terrible Latin pronunciation? It messed up his campaign when his native guide took him to the wrong place by mistake. Or did you know Nero believed that he was really meant to be an opera singer? Professor Fears also has a knack for bringing battles to life–sometimes in more detail than I really needed! And he makes some alarming comparisons between the fall of the Roman Republic and the present day. I’ve always loved Winston Churchill, and Professor Fears does too. He brought out so many stories and anecdotes about Churchill. You end up feeling like you know him, and everyone else in his life too. If you want a sweeping coverage of human history, The Wisdom of History is for you. Even with such a broad focus, Professor Fears picks moments and individuals within it to share. This is not by any means dry and intellectual history. The funny thing is, by looking at the individuals you also learn about the broader trends and larger shape of history. It’s probably good that I mostly listen to these courses alone in my car, as I frequently find myself talking back. It’s not exactly a class discussion, but sort of! They’re immensely engaging. So if there’s something you’d like to learn more about (some history, maybe? ), you can explore the Great Courses catalog online. Don’t be put off by the prices–they have near-constant 75% off sales, or even more. And anyway, it’s a lot less than most actual college classes–and no exam at the end! Wow, what an excellent idea. It really does sound like the best of college without the worst of it! Sounds like something I’d be interested in. I bet you’d like it. And they have tons of different subjects to choose from. We’ve been listening to (or watching) the Great Courses for some time now, and love them. We used both “Famous Greeks” and “Famous Romans” when my daughter and I studied Ancient History (we homeschooled.) Some other really wonderful courses are Great Pharoahs of Egypt, Alex Fillipenko’s astronomy course, the one on architecture and structure, John McWhorter’s first course… oh, there are hardly any we haven’t liked. I think our extended family has almost all of them, one way or another! 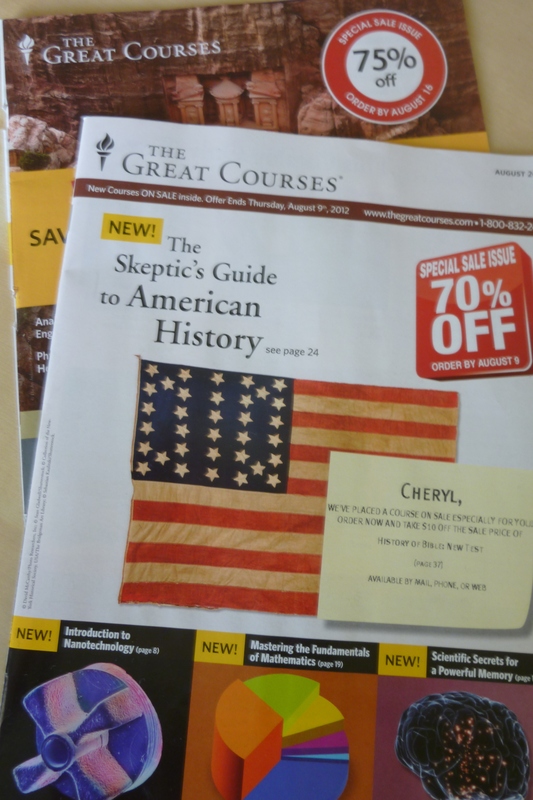 A hint — the list price is usually a bit high, but every course will go on sale within the space of a year; if you get on their mailing list, you’ll find out which courses are on sale. And pay attention to the stuff about whether you should get audio or video; it matters for some courses. While I’m all for buying the courses directly from The Teaching Company, you can sometimes find used copies on eBay (but check the price, because sometimes it’s higher than the sale price at The Teaching Company will be.) Some libraries also have copies you can borrow. And you can call the Teaching Company to ask when a particular series will go on sale; they may not know, but if it’s scheduled soon, they can sometimes tell you.